Shaping the journey | Alzheimer Society of B.C. Shaping the Journey: living with dementia® is an educational program designed specifically for people experiencing the early symptoms of Alzheimer’s disease or another dementia, as well as a care partner, family member, or friend. It is for people who want to explore the journey ahead in a positive and supportive environment. To register for Shaping the Journey: living with dementia®, contact your local Alzheimer Resource Centre. The Shaping the Journey: living with dementia® program includes a self-guided workbook developed specifically for people with dementia. This workbook has valuable information that will help you in considering some important issues. 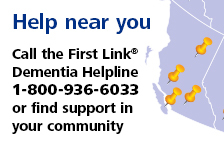 It offers personal planning tools and details on how to connect with the Alzheimer Society of B.C. Download the full workbook (PDF 7MB).